This piece was written in early January, 2017 after the Nov. 2016 elections. 1. The New Confederacy won. The New Confederacy is composed of the most reactionary factions of capital allied with racist/nativist, right-wing populists. The Republican Party is the political expression of this alliance. We use the term “New Confederacy” to emphasize the fact that this right-wing political force is rooted in an explicitly racist program and strategy. This alliance has won unified control of the federal government, and has control of more states than it ever has before. And it won with a minority of voters, using state-by-state voting blocs, subjected to voter suppression and disenfranchisement, to build a majority in the fundamentally racist institution of the Electoral College. The New Confederacy is a minority alliance, and it uses every tool it can to rule over the majority, as this election profoundly illustrates. The New Confederacy is undeniably our immediate and most dangerous enemy. Let’s dispense of our confusion on that front. We have to defeat the Right. 2. The potent combination of racism and anti-elite/populist themes are the basis of Donald Trump’s remarkable and terrifying victory. Trump’s promises to “Make American Great Again” and “Put American First” joined resentment about trade policies with frustration over perceived US decline on the world stage. Many summations say the Democrats lost because of their abandonment of the working class and their lack of a populist message—but that’s only partly true. Racism and nativism are central and decisive factors in Trump’s win. 3. Trump’s campaign also used and benefited from misogyny: Trump voters believed allegations against Clinton that would never have stuck had she not been a woman. And Trump got a pass from conservative white women and the Christian right on multiple allegations of sexual assault (and his own boasting) that would never have been tolerated from a woman candidate or even a male candidate of color. 4. Class cannot be ceded to the Right—when the Left does that, it loses. The Right populist program connected economic anxiety with anti-immigrant sentiment. Lacking a Left, progressive economic program, Clinton and the neo-liberals couldn’t offer any alternative, and in fact came to typify the exact kind of elite that Trump railed against. 5. The Left’s vision and program must lead—it’s the only vision that is a solution to the crises we face, and the only real alternative to the enemy we must confront. The Democrats cannot defeat the New Confederacy on their own, nor can a coalition that includes progressives and the Left in which the neoliberal and corporate ideas and strategies are the leading vision. We can’t do it alone, though, and must make tactical alliances with both New Deal and some neoliberal Democrats—forces we must use in our fight against the New Confederacy. We shouldn’t lose ourselves in that alliance, but we should be realistic about what we can accomplish against the formidability of the New Confederacy. 6. We need to get serious about what it will take to have a winning united front. We will need to build a massive coalition that draws in millions on the basis of a progressive economic populism, the expansion of democratic rights and an anti-racist program. Approaches to the electoral question that promote Third Partyism based on purity and episodic expression over impact and scale (i.e., the Greens) aren’t a solution, and cynically sitting out elections certainly isn’t. Those who aren’t serious about this task are also not serious about socialism and fundamental social transformation. We contend that IPOs are the tool that can help build both build an independent Left and contest the neoliberal leadership of the Democratic party from both inside and outside the party’s walls, building both electoral and mobilization capacities: by uniting with the party’s Left wing inside, and the movement forces pushing progressives Leftward outside of it. 8. We should work to support and build the strength of ongoing resistance movements, like NoDAPL, the Movement for Black Lives, the immigrant rights movement, and others, which will face increased repression and opposition in the face of an emboldened Right, which now also controls the military. And our work needs to focus on how we not just defy the New Confederacy, but defend especially vulnerable populations from its violence and the violence it will unleash among racist and reactionary forces. And we should anticipate and encourage new explosions of resistance–the New Confederacy’s program will attack women, lgbt people, the environment, and undoubtedly push for war, and we should be prepared to stand up with the people who fight back. 9. It is right to rebel against reactionaries! 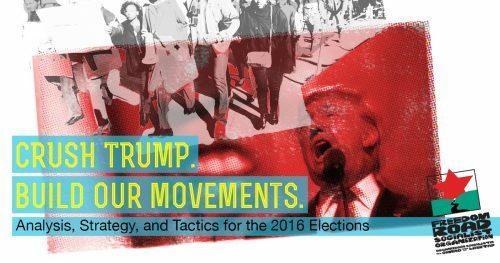 We need to struggle alongside those whose energies will be directed primarily toward protest tactics and resistance to Trump. We should support them in becoming effective demonstrations of defiance to the Trump regime, and away from mere symbolic action. Less sign holding, more disruption; less vigils, more occupation; etc. Think of the way the Tea Party immediately brought the Obama administration’s plan to a halt. 10. Demographic changes alone won’t “fix” the problems we have with the white working class. We need to develop a program on white working people, and not presume that changing demographics will inevitably end the decisive role they play in politics. The task of building a majoritarian coalition—which cannot be built without the participation of a significant number of working class whites—to defeat the New Confederacy is a political one. *What do we mean by an independent political organization? We are calling for the creation of organizations that can unite and lead the political struggle of the strategic alliance of the national liberation movements and the multi-national working class in this historical period. We want truly mass organizations, rooted in precinct-level organizational structures and people’s assemblies at the ward/district level. In this way the IPO will truly be an instrument for fusing revolutionary politics with the leadership and everyday struggles of the people. Our ultimate vision is an organization in the hundreds of thousands, rooted among Black and Brown communities and organized workers, based in but not limited to the South and Southwest. We imagine political organizations that unite in practice the strategic alliance and which, in turn, is able to operate nimbly as a leading force within a broader united front. While election campaigns must be a core component of what the party does, we see the party primarily as the organizational form that facilitates the cohering of the strategic alliance in practice and allows it to lead the broader united front. We view the political party as a key vehicle for both facilitating the integration of various sectors of struggle (living wage, affordable housing, police violence, contract negotiations, etc) into a single political force and for the construction of the people’s assembly vehicles at the grassroots level. From this perspective the party we are talking about is not a cadre organization, like the Bolsheviks. It is more like a mass Left front organization, like the ANC during the struggle against apartheid in which trade unions, the communist party, and nationalist organizations all combined to fight against the regime of apartheid. Similarly, we believe that what we need is a political organization that can coordinate the struggle against first the New Confederacy and then neoliberalism as a whole.